It is said that there is Arabic countries where every day people drink coffee. It is said that one of them is Syria, but we can’t prove it soon. 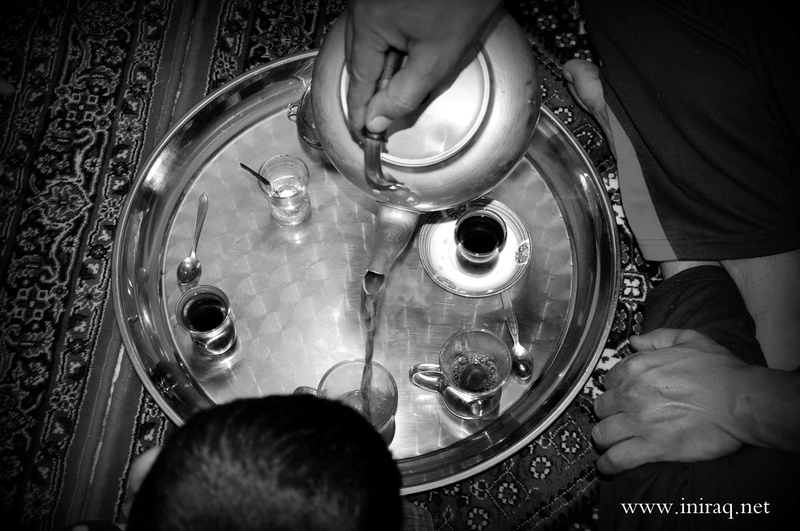 Iraq is one of the countries where national drink is a black tea. Here black tea is not the only name, but real color, because they boil the tea brew in the kettle on the small flame 2-5 minutes (tea drew is not filled up by hot water). Traditional tea crockery is small glass with a waist and small saucer. At home the black tea is made this way: tea drew is boiled in the kettle, the deep plate is filled by warm water, putted into it the crockery for cleaning it before fill the next cup. After that the kettle is putted on the lamp that works on the oil, this helps to keep tea hot. At the breakfast Iraqis drink pure tea, but at lunch they add few grains of cardamom into the kettle. 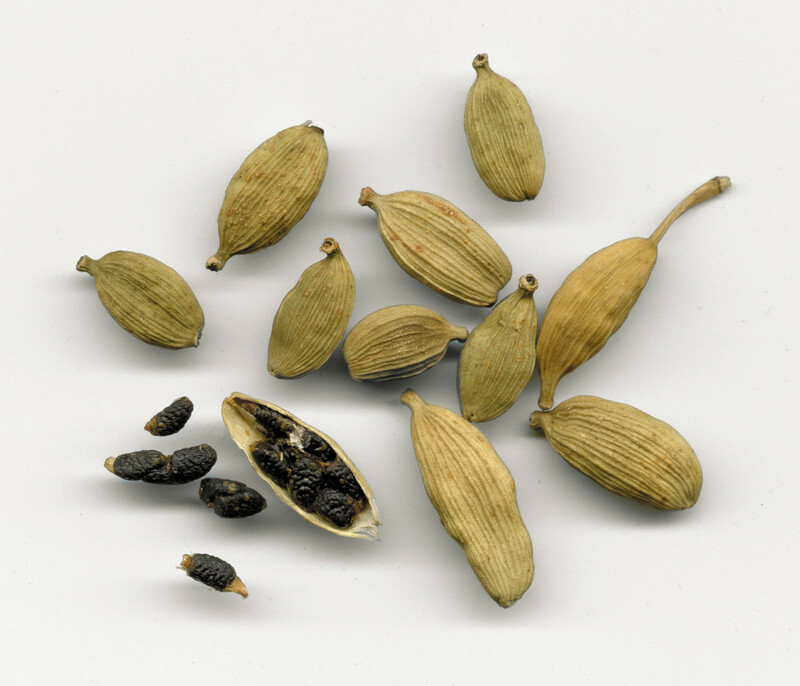 Also Iraqi tea is very sweet (may be the reason not only is people love sweet, but so strong tea will be bitter with not enough sugar into it). When tea is drawn for several persons (usually they make it on the iron tray) first of all sugar is putting into the cup, after that – tea and then they take cups for each one. How it can be known that person wants one cup more? If person set cup upright it means he wants more, if person laid a cup aflat it means that he doesn’t want more tea. In distinction from Russian tradition to drink tea with cakes, candies or jam here tea is drunk without those stuffs, only at the breakfast it is drunk with bread and cheese (it is a common breakfast in Iraq). Tea with lemon is doesn’t have streak of Iraqi tradition. Sometimes milk is added, but only at dinner, when they also eat bread and cheese. 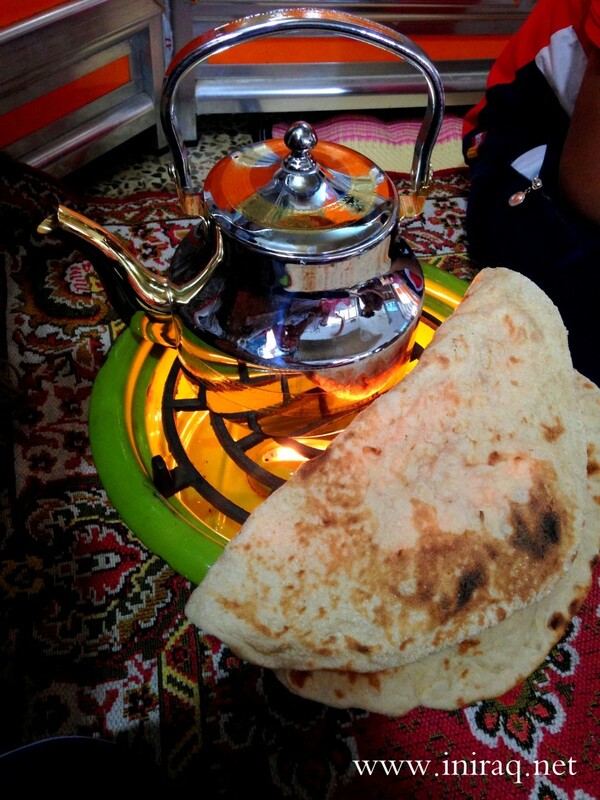 The most delicious tea for Iraqis is a tea boiled not on the fire but on the coals. Even a porcelain kettle is suitable for that. Usually it is made after preparing shashlik – they put the kettle on the small hot coals. 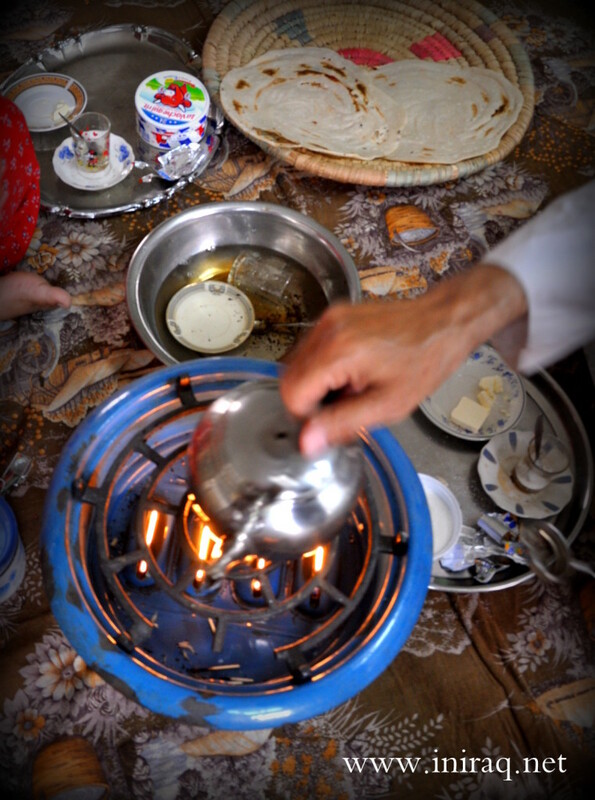 Also in Iraq is popular tea prepared from dried lime – noomi basra. It also is boiled in the kettle and drunk with sugar. But in home this tea is prepared by fanciers or people with cold (because numi basra tea consists a lot of vitamin C). The green tea is absolutely not popular, and it is very hard to find a fancier of it. It is sold in some shops, near with other not popular products, like coffee, but you can’t find this tea in home or café. Coffee fanciers will be disappointed in Iraq. About what is wrong with coffee in Iraq – read in the next article.